I would like to share with you all this beautiful experience during my recent trip to India. 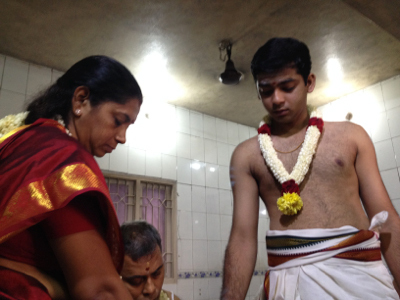 I had, a couple of weeks ago, made a 10-day trip to Chennai from the US, to attend the thread ceremony for my nephew. Right from the time I left the US, I have been sincerely intending to see Mohanji, my Guru, personally. I knew that He was going to be in India but his plan was to be in the North and I understood that He was going to be in retreat. So I could not plan to visit him. The trip was very tight with attending the religious ceremonies and to spend time with my mother and other relatives, some of them aged and needing some time and attention. I had informed Mohanji about my trip and He had asked me to call him upon reaching Chennai, which I did. Mohanji granted his blessings to our family and assured us that He will be present during the religious ceremonies. The ceremony, which took place on the Sivarathri day, went very well, we were graced with the presence of Shirdi Sai Baba and Mohanji and other Masters during the event. 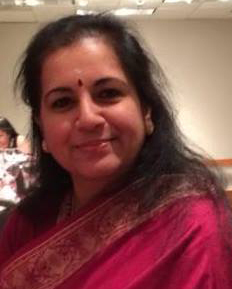 Now that the main purpose of my visit was over, I was really brooding over the fact that I was not able to go North to visit Mohanji and also that I was not going to be able to make another trip to India this year and be part of the Kailash Yatra. My prayers was answered when the thought of making an impromptu trip to Thiruvannamalai come to mind. It was Friday evening and I called Mohanji again and told Him about this plan. He said it is a great idea and he gave me the following instructions – (a) serve yogurt rice and pappadam to 11 saints inside the temple, he insisted on the “pappadam” and (b) do a full prostration at the inner sanctum sanctorum of the temple. Now, my conversation with Mohanji happened late Friday night and shops were closed in Chennai, our trip to Thiruvannamalai had been planned for early morning next day. (South Indian homes always have a stock of pappadam in their homes, however we had only 13 pappadams left in our stock.) Next morning, we woke up early, fried the pappadams from home and decided to buy the yogurt rice from the temple so that it can be served fresh to the saints. 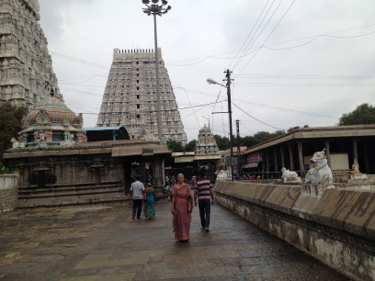 We left home at about 5 am and had a smooth drive to the temple and were there by noon. My mother and my nephew joined me on this trip. We entered the temple, and as we passed the Murugan Temple where Lord Muruga had given darshan to Arunagirinathar Swami, we saw a very elegant and striking Sadhu with Jada and a sparkle in his eyes, He smiled and nodded a welcome to us. It was as though He was waiting for us to arrive. I folded my hands in respect to him and walked ahead. I noticed that in the steps behind the Murugan temple were about 8 saints sitting and I mentioned to Amma that we should give them the yogurt rice packets. I also mentioned to her about the Sapta Rishi darshan during Mohanji’s recent trip to Karnataka with a few of his devotees. We then went straight ahead to the shops where they sell prasadams to buy the yogurt rice but the shop had all the other rice specialties except Yogurt Rice! Amma was getting anxious because she had told me that we will make the yogurt rice at home but I had replied that we will get it fresh at the temple. However, I was unperturbed as I was sure that when Mohanji tells us to carry out a task and we are sincere about it, He makes sure that it happens beyond our expectations. I went outside the temple to a restaurant nearby, they said they had it and so I paid for the rice packets. After that I waited and waited, there was no sign of them handing over the packets. After about half an hour, I asked the man at the counter what was going on? He said they did not have enough so he had asked his father to get it ready from the village nearby. In about 15-20 minutes a man in a cycle arrived with 11 packets of freshly prepared yogurt rice, warm and wrapped in banana leaves. The sadhus were all still there behind the Murugan Temple. The first offering was to this Sadhu with Jada and a sparkle in his eyes. When rice and pappadam was offered to him, he said he had already eaten, and will take only the pappadam. 7 packets were distributed to 7 sadhus in saffron robes and there was one Siddha purusha (wearing a white dhoti and a white towel) sitting at a higher step in a very peculiar posture bent like an inverted “C” against the wall (Thiruvannamalai is a well-known residing place of Siddhas and Masters.) There was a very old saint sitting on the other side and two old women. So papaddam and rice were given to 11 saints. By this time, two dogs arrived. One dog took the pappadam and ate it. The other dog, an extremely beautiful being, as though chiseled in gold but a very peaceful look in the eyes was looking directly at us as we walked into the temple. So the 11 packets of rice and 13 pappadams were accepted. I have no idea who the Mahans were, but I could sense the closeness with this one Saint who welcomed us. I was drawn to him, His eyes were so powerful and so familiar. The whole experience was surreal filled with overpowering grace. I was so peaceful while all this was happening, I was aware that I had the camera with me, but I could not get myself to take a picture of the Saints. They were precious moments (I now feel so bad for not taking the photos), but at that time, I just could not bring myself to do it! Now as we moved on, the real challenge, while visiting Arunachala, we would normally arrange through a friend with a priest at the temple to take us inside the main temple. This time, neither the friend nor the priest was available. Deep inside me, I was sure that we will go near Eashwara, something was telling me strongly. I was just reciting Mohanji Gayatri in my mind and we stood in the line with about 50-70 people ahead of us. As we reached closer to the main sanctuary there were a number of people coming out of the garba griha, so we got the opportunity to stand in front of the deity for a long time and pray. It is difficult to go inside the garba griha unless you know someone there or part of a high delegation. I had no mind to leave the place without entering inside as Mohanji had instructed me to do a namaskar right inside, so we were hanging around there for some time. The gatekeeper was not happy and was pushing us away. Finally, I talked to the priest there and told him that we wanted to go in and after paying a small sum to the gatekeeper, we were allowed to go right inside, in front of the Jyotirlinga. The “Arut Perum Jyoti – Compassionate light of God” totally consumes you there! What an amazing darshan, I was so overwhelmed by the grace and compassion of the Lord. We did an archana to the Lord and I also did a full prostration right there. The gatekeeper/policemen were saying that we cannot do a namaskaram there, but I paid no heed. Thank you for giving this opportunity, Mohanji. The moment I put my forehead on the floor of the temple, I could feel the vibration in my entire body. It was like an earthquake happening inside the mountain. I was totally humbled and ever grateful for being able to do this. 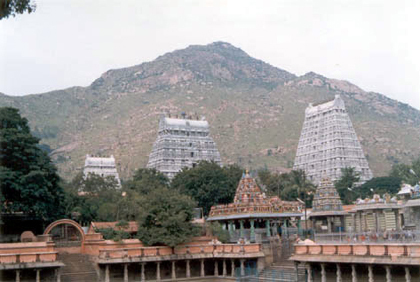 Thiruvannamalai is Dakshin Kailash and Shiva himself resides in the mountain. We then came to the Devi temple. Normally we would visit Devi first and then go to Maheshwara, but somehow it happened the other way around! There again the lines were long. As we were proceeding closer to the deity, I had this deep desire to be able to go to the garba griha here as well. As this thought came, I suddenly turned around and saw to my surprise the same Saint we had seen at the beginning, the one with the long jada and smiling eyes. I got a bit of a jolt. He was smiling. As soon as I saw him, my inner voice said, nothing to worry, you will be able to go inside the main sanctuary now. I don’t know how and where the saint appeared from. In a few minutes, we were right in front of the deity, and among so many people standing there, the priest opened the door and gestured to me and Amma and asked us to enter the garba griha, this was a total miracle! I was totally awe-struck! We offered prayers to the Divine Mother. It was so blissful and fulfilling. As we came out of the Devi shrine, the Saint was standing right there! He had a wooden wand in his hand. I went and prostrated before him (Amma did the same). He gave blessings in pure Tamil, I had some cash in my hand and asked him if I can give him a dakshina and he smiled and said I most certainly can and accepted it. I was overjoyed at the same time humbled. After this we came out and we really had no desire for anything else. The Saint however was following us, He was walking with someone talking to him. We continued the Parikrama of the Girivalam in the car, as we were getting off the car to the other Linga temples around the mountain. I spotted the Saint again 2-3 times. Finally as we were reaching Ramanashram, the Saint passed us and walked ahead. At the Ramana Ashram, we had the honor of meeting with Swami Shantananda Puri Maharaj, a disciple of Sri Swami Purushottamananda Puri Maharaj. Swamiji was very loving and talked to us for almost an hour and bless us well. As we were at the Ashram amongst the beautiful Arunachala Hills, it dawned on me that the Saint who welcomed us and literally took us around the Temple and blessed us and walked us back was none other than Mohanji himself. He had accepted the Pappadam as he had mentioned in the call the earlier day! It was really such a beautiful experience which words cannot do justice to. I don’t’ know whether I deserve such love and compassion, but I am so grateful for this. March 1 was my mother’s birthday, so I am thankful that I could accompany her on this trip – even spending time with Mom is a rarity these days when you are so far away geographically. Also it was the day of Amavasya (New Moon), so offering food and pappadam to the Saints is very auspicious. I have been following Mohanji’s instruction of doing the Trikala pooja (Offering it to the Kula devata, Ishta devata, Naga devata, Pitr devata and Gurus) everyday before taking food and I think as a result this miraculous opportunity was given. Thank you, Mohanji, from the bottom of my heart.